My name is Robin Ashford-Macy, mother of one fabulous daughter, and owner of VIN-T BIKINI, a swimwear company that specializes in recreating t-shirts into bikinis. The company is based here in New York City. Currently I’m working on the anti-bullying campaign FREE2LUV with founder Tonya Sandis. We have been so fortunate to be connected with this an amazing cause. Bullying is such a serious problem on so many levels that we seriously need to take a step back and think before we speak. We also need to teach our children to do the same. Also, I am a spokesperson for a line of jewelry named ELEGANT, a company based in Istanbul, Turkey, that focuses on the evil eye. Jewelry featuring the evil eye happens to be one of my favorite types of jewelry. Projects are in the works at all times! Seminole Hard Rock Hotel and Casino will be hosting a trunk show for VIN-T BIKINI in July, 2012, so we are looking forward to working with S.H.R. once again. I was born in Scottsdale, Arizona, and I was raised in Nogales, Arizona. Nogales in right on the Arizona-Mexico boarder. Intoxicated by both what New York City had to offer and by the diversity of culture, I choose to make the city my home in the mid 90’s. My Oma (grandmother in German). I love to travel, drink wine, and enjoy great food. I also love my friends and family very much! I do not like people who gossip. Batman (I love it when men wear a mask and cape) and Wonder Woman. I have many favorites, but LAVO is one of them. Receiving good news, my work, and my lover. Why do you think most women are not happy with their looks? I never really understood why women felt that way until I started my swimwear company. Then I noticed it nonstop! Nothing is good enough. Maybe wanting to look like someone else, or being told “you need to lose weight,” or “you need implants” triggers women to be self conscious. I’m sure there’s more to it. I try not to pay too much attention to this kind of talk and always teach my daughter to love herself for who she is. Once we love what we have and embrace it, we become more attractive in our own way. Although I’m not opposed to plastic surgery or botox, I think we should practice genuinely loving who we are. 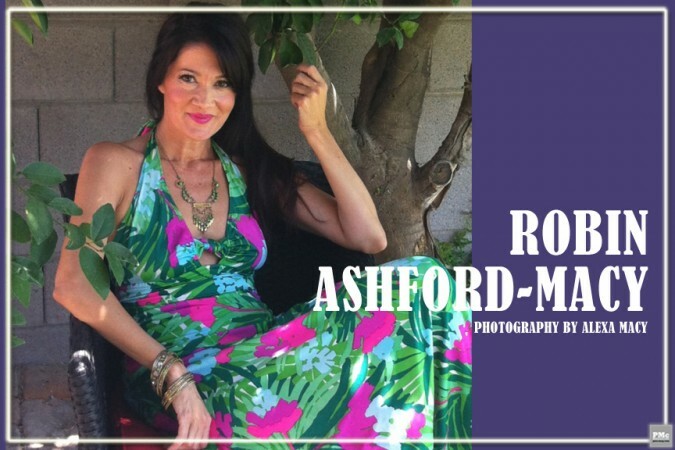 Robin Ashford-Macy founded Vin-T Bikini in 2006 and serves as the company’s President and Chief Executive Officer through her privately held holding company Robin Ashford Inc. Ms. Ashford-Macy is an Arizona native, born in Scottsdale and reared in Southern Arizona. In the mid 90’s she relocated to New York City. After a stint of several years with insurance giant Marsh Inc., she grew bored with the insurance industry and set about exploring potential opportunities in the area of fashion. In late 2004 she conceived the idea of custom one-of-a-kind swimwear created from vintage t-shirts. After refining her concept and assessing market potential, she embarked on the founding of Vin-T Bikini. Ms. Ashford-Macy is steadily gaining recognition as one of the industry’s bold new designers with a flare for hip swimwear that conveys a contemporary, downtown look. Her inaugural line debuted Christmas 2007 throughout North America and in Europe and in South America and Australia spring 2008. Active in various community groups and events, Ms. Ashford-Macy counts among her memberships and activities the NY Museum of National History, Wildlife Conservation Society, New York Metropolitan Museum of Art, NY Women’s Republican Club, Aids Walk New York, and many other community service and philanthropic organizations.